Developing Skills vs. 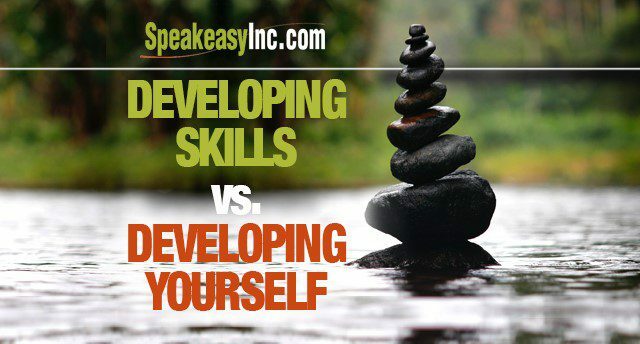 Developing Yourself | Speakeasy Inc. There is nothing — nothing — more powerful in this world than authentic, passionate connection with another human being. It’s the only way we’ll solve any of the myriad problems facing our world today. It enables your societal and community contributions. It drives your business growth, your professional progress, and fuels your personal well being. It is absolutely the most critical component to any success you will ever experience. And, it’s not a skill you learn. Communicating in an authentic and powerful way doesn’t mean cracking a mysterious code or formulating your sentence to match a pattern. It’s not a method you follow and there is no checklist to be sure you’ve “got it.” There are no “five key skills” to master in order to be a great communicator. Get our drift? It’s much simpler — AND — much tougher than that. Becoming a truly powerful communicator doesn’t mean changing who you are, it means becoming more of who you are. It’s not about learning something new… it’s about connecting with something very old — your core. It means working hard enough that you believe in yourself — in your point of view — and getting comfortable enough that you’re willing, even eager, to open up to the ideas of others. And then running that cycle all over again… and then again. Deep inside you there is a vital core — a wealth of thought, emotion, and experience. It is the center of everything that makes you unique. Tapping into that part of you is the first step on the journey toward connecting with the world around you. It awakens your awareness and unleashes your courage. And it begins to build a bridge between what you want and where you are. A bridge that is critical to communication and essential to success. It isn’t always seeing everything the same as others, but it is striving to see what they see. It isn’t always thinking like others, but it is striving to know what they think. It isn’t always feeling like others, but it is striving to know what they feel. Always. Now, the journey takes on new dimension. You have to take the risk to become aware of “them.” You must venture to discover their values… concerns… and aspirations. That’s how you build the power to persuade. And that’s how you inspire others to advance toward shared goals. To drive progress in this world you have to fuel passion in yourself and others. And with communication that passion is grounded in trust. To create trust, you have to speak in a way that is congruent with who you are and what you believe. But you must listen in a way that is open to the ideas of others. And above all, you have to be consistent in your vision and commitment. Forget new “skills” and the latest “technique”… Rather work to become more of who you really are and to be more open to those around you. Start that journey with trust as your guide and you’ll generate a rare power — the power to create solutions. The power to produce results. The power to connect.